If there is one thing that you should know about beauty (and it is life changing) it’s determining your skin undertones. When you know yours you are able to adjust the colors you wear accordingly to better suit you. In college one of my friends asked me if I had ever had my "colors done", I said no. As I had no idea what she was talking about. That is when I learned about my undertones. I always wore pink blush, after I found out I was a warm undertone I tried peach blush, and let me tell you it made a world of difference. Of course rules are meant to be broken. This is just a guide to accentuate your features. • Place a white piece of paper next to your arm. Focus on your arms for 11-23 seconds and then look at the paper. Neutral: You either have a mix of warm and cool undertones, or you do not have a distinctive undertone. Lucky you can wear any colors you wish. Warm: brown, black or hazel eyes, and black, brown, blonde, red hair. NOTE: there are always exceptions to the rule. So tell me what is your undertone? I've had my colors done, and I have warm undertones. I find that this doesn't apply only to what colors your make-up should have, but even your clothes! 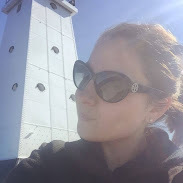 I look dreadful in stark white, for instance, but a light cream color makes my face glow. Thanks for the tips on how to determine my undertones. I definitely am a warm person due to my hazel eyes and brown hair :) I don't know if I could give up my pink blush though! I tried the paper test thing and it didn't work! :( I've always heard that you're supposed to go out in natural light and look at the underside of your arms...kinda weird, but if your veins appear bluish/purplish, you have cool (pink) undertones, and if your veins appear more green, you have warm (yellow) undertones. Thanks for the tips, very helpful!! I never new how to figure this out - I'm going to do this when I'm not surrounded by people. lol. I've never been able to figure this out, but I think I'm a warm! I'm so doing this. Thank you so much for sharing. I'm definitely cool undertones, although I've always wished I was warm. The grass is always greener on the other side, I guess! wow this is helpful!!! i am hazel eyes, light brown hair. 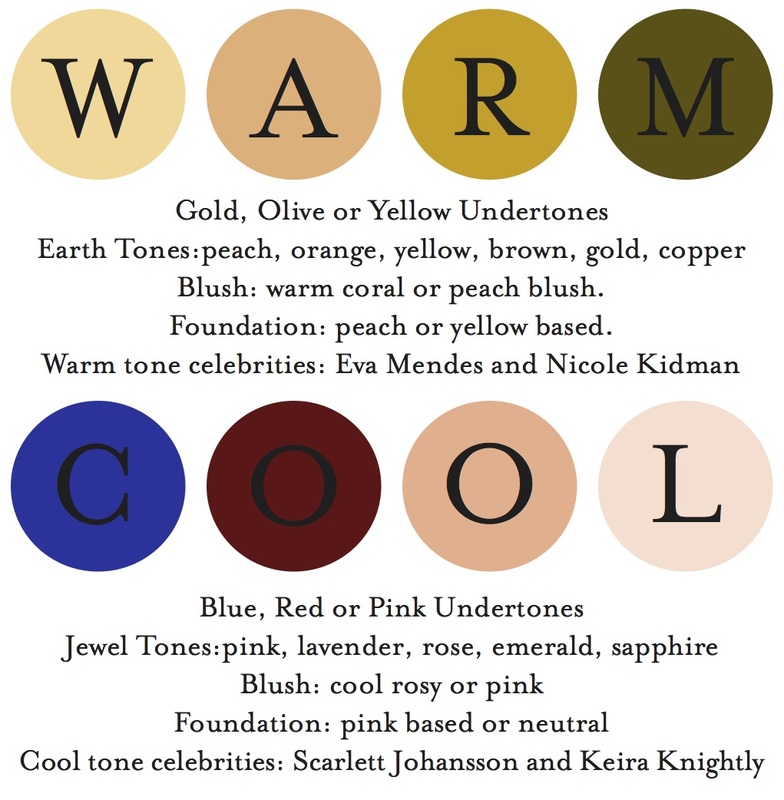 and i now know i am a warm tone. this is perfect timing too because I need to buy foundation to wear for a wedding i am in next week. i have never worn or bought foundation before. 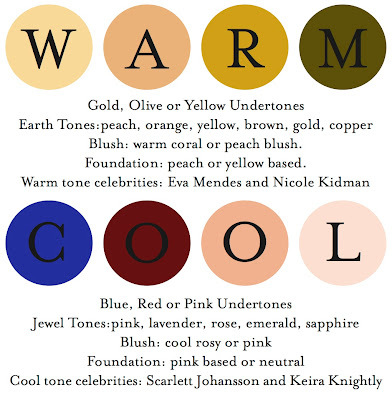 knowing i am a warm tone is going to make it so much easier!! thank you!!!! thanks for the tips! I am gonna try to figure out my tone later today. Can a person with red hair and green eyes have a cool undertone instead of a warm undertone?